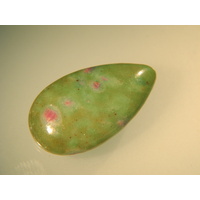 Ruby in Fuchsite is a relatively new gemstone that originates from India. It should not be confused with Ruby in Zoisite. 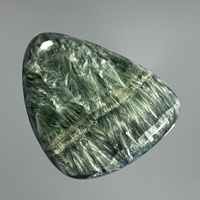 Fuchsite is generally lighter in colour than Zoisite, and Fuchsite is a green form of Muscovite. These stones can also contain Kyanite, that shows up as a blue coloured inclusion. Fuchsite has a hardness of 2.5 to 4, and ruby has a hardness of 8.